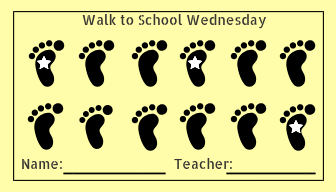 Come celebrate National Walk to School Day Wednesday October 3rd, as we kick off our new WEEKLY Walk to School Wednesday program. Walking school buses will meet at 7:05 am, if you would like to join some friends. Click here for the WALKING BUS ROUTES.